Jean Clements Carswell, age 79, of Rutherfordton, NC, died Tuesday, November 29, 2016, at Hospice House of Rutherford County. 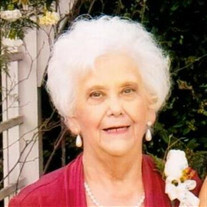 She was a native of Rutherford County and the daughter of the late W.L. Clements and the late Ethel Lewis Clements. She was a retired cafeteria manager at R-S Central High School after 27 years, owner of William and Mary Antiques and former owner of Jeans Kitchen. She was of the Baptist faith. Jean was also preceded in death by her husband E.W. Carswell and four brothers; Quay, Bobby, Julane and Hoyt Clements. The family will receive friends from 6:00 PM to 8:00 PM, Wednesday, November 30, 2016 at McMahan's Funeral Home. The funeral service will be at Green Hill Baptist Church at 3:00 PM, Thursday, December 1, 2016 with Rev. John Bridges, Dr. Bob Morgan and Dr. Hampton Casebolt officiating. The body will lie in state 30 minutes prior to the service. Interment will be at Green Hill Baptist Church Cemetery, Rutherfordton, NC. Memorials may be made to Hospice of Rutherford County at P.O. Box 336 Forest City, NC 28043. Online guest register at www.mcmahansfuneralhome.com. McMahan's Funeral Home and Cremation Services in charge of the arrangements.